Bird Net for any Architectural Configuration including Courtyards, Rooftops, Overhangs, Parking Garages, etc. Heavy Duty Sparrows Swallows 4"
Bird netting is the strongest and most versatile bird exclusion system in the world! Construction: 3 x 2 ply. Three groups of two strands are wrapped into a tight, rope-like group of six. 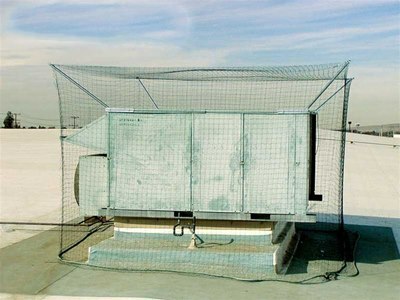 Install Bird netting bird exclusion products in any bird pressure area. Any enclosed or semi-enclosed area, opening or building configuration where pest birds need to be excluded. Also useful for pest bird exclusion in airplane hangars and on rooftops or outdoor courtyards as well as aquaculture and agricultural applications. Bird netting consists of high density polyethylene twine that is twisted and knotted to form a strong impenetrable bird barrier to pest birds. The coloring (Black, Beige & Milky White) and U.V. treatment are embedded in the composition, making the bird net more resistant to the effects of the sun with a more consistent coloring throughout. A cable support structure is installed on the structure with steel attachments applicable to the substrate (See photo here). The bird netting is then stretched tight and attached to the cable support structure with steel bird net rings, forming a tight, solid, impenetrable bird barrier to humanely exclude the targeted pest bird species. The twine is knitted into sheets on a net-making machine. A pressure of 5 tons is then applied to the net to stretch it into squares. The net is then heat set in an enclosed system at a temperature of 200 F for 3 minutes. Standard mesh sizes are 3/4", 1-1/8" and 2", but other mesh sizes can be manufactured. Nets can be custom made in any length or width. For ease of installation, corners and long sides are marked. StealthNet is available in stock colors of Black, Stone (beige) and Translucent, with White available by special order. Six strands of polyethylene, each 12/1000" (hence the name 12/6), are wrapped rope-like into one strong, rot-resistant, U.V. protected twine. With a breaking strength of 44 lbs per twisted strand, StealthNet is the strongest polyethylene netting available in the world. StealthNet's U.V.-treatment and color pigmentation are embedded in the composition (not just dipped), making the net more resistant to the effects of the sun with a more consistent coloring throughout. 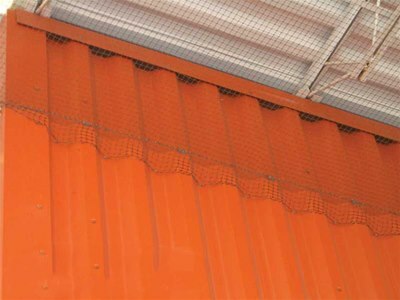 Flame-retardant netting is now available through special order. Softening point in the region of 250 F.
Melting point in excess of 270 F. Burns with difficulty. May be heated for short periods up to 600 F.
Polyethylene retains its flexibility at very low temperatures and does not become rigid under freezing conditions. Burns slowly in air (ASTM Test 1.0?/min); fine filaments tend to melt and drop away before propagating a flame. Polyethylene, a paraffin hydrocarbon, is chemically inert and is highly resistant to a wide range of chemicals at ordinary temperatures. It does not rot or absorb water. Polyethylene fibers have a high resistance to acids and alkalids at all concentrations, but are attacked by nitric acid. Insoluble in most common organic solvents at room temperature. The fibers are not ingested by insects and are completely resistant to bacteria, mildew and other micro-organisms, making them virtually rot proof. Wind passes effortlessly through StealthNet, although smaller mesh sizes are effected by wind to a larger degree. There are seven elements in every netting job. If you pick the correct piece of hardware for each of the seven elements, you will be able to install a professional, effective and long-lasting netting application every time. The basic configuration of every net job is a strong, tensioned cable which borders an opening to which netting is later attached. The cable is attached to the building using a variety of hardware attachments, and the netting is attached to the cable using net rings. Following is a rundown of the seven basic elements in a net job:? Corner attachments are the most important part of a netting installation. They are used where cables turn corners or where cables end. They withstand a great deal of pressure. 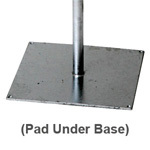 There are two important consider- ations regarding corner attachments where you install them and which ones you choose. The location of corner attachments is usually quite simple to determine. It is where natural corners fall in the shape of the net or where cables end at a wall. When netting off a square opening on the side of a building, the corner attachments are placed in each corner (four). When a three dimensional job is installed, corner attachments may be placed on opposite walls with a cable running between them. This cable forces the net to take a corner. The choice of which attachment to use is determined by the substrate material surrounding your job. 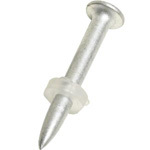 If you are working with concrete, you need to install netbolts that expand when you tighten them . 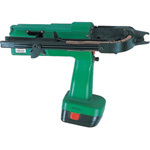 Likewise, if you are working with wood, you need to use corner attachments which fasten into wood. These anchors must be strong because great tension will be applied by the system, and the corners will take most of the strain. Like the corner attachments, the intermediates also hold the cable to the structure. In this case, however, the job of these fasteners is to hold the cable tight against the wall along the side of the net job, so the cable will not bow away and allow birds to enter the bird-free zone. If the cable were attached in just the corners, the tension of the netting would pull the cable away from the walls. The inter- mediate attachments, when placed every few feet along the run of the cable, prevent this from happening. For pigeons and larger birds it is acceptable to install them every three to four feet. For smaller birds, like sparrows and swallows, the attachments must be much closer together (no more than two feet), so small birds cannot get behind the cable gaps. All of Birdbusters intermediate attachments are designed to be strong yet discreet. 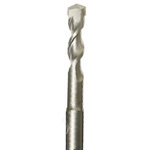 Different intermediate attachments are available for different substrate materials. 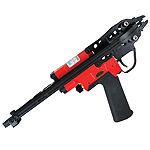 Attachments are available for stone, steel, wood, sheet metal and stucco. 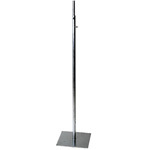 Hardware is available in galvanized or stainless steel versions. As previously stated, the cable frames the entire net pro ject and forces the net to take corners on three dimension- al jobs. 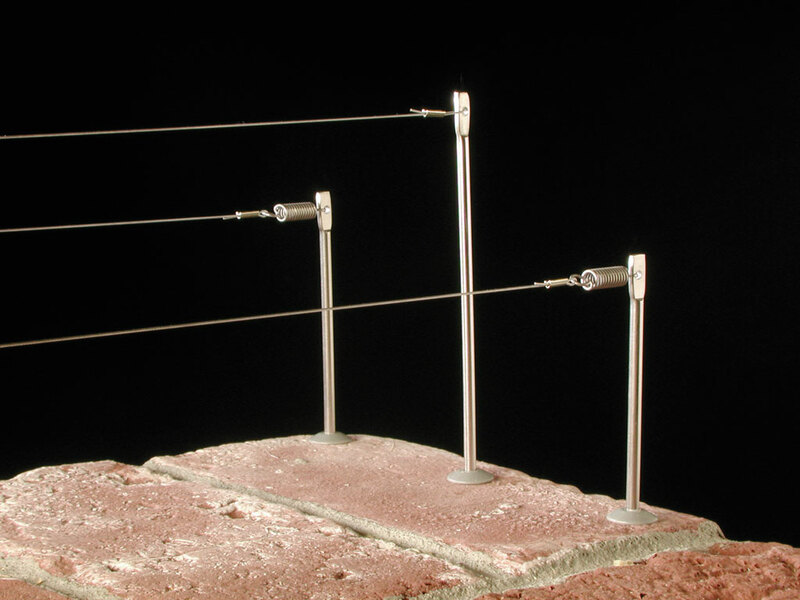 Birdbusters's cable is available in galvanized and stainless steel. The cable is designed to be exceptionally strong, yet very hard to see. The cable may be used under large panels of netting on outdoor, horizontal applications (like over a courtyard), and is especially critical if snow or ice could build up on the netting. The cable is looped at one end through the corner attachment, runs through every intermediate attachment, and is looped at the other end through the turnbuckle. Ferrules are used to secure loops in the cable at each end (at corner attachments). 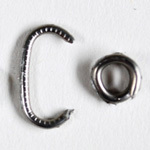 One loop is fastened to a corner attachment; the other loop to an opened turnbuckle. The ferrules are slid onto the cable before the loop is formed and then crushed around the cable with Bird Barrier's powerful ratchet crimper. 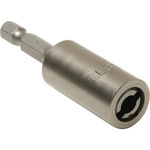 When using the ratchet crimper place the ferrule into the middle or end slot with the narrow part facing up and then crimp down once on each end of the ferrule crushing both ends completely (you must crimp each ferrule twice for a strong hold). Always use 2 ferrules per loop for added strength and reliability of the perimeter cable system.This creates a strong, yet discreet, loop. The netting is fastened to the cable using a special Net Ring tool. This tool loops a small piece of metal around the netting and the cable. It is easy to use, carries a cartridge of 50 rings, and is the fastest and strongest way of attaching the net to the cable. Use one loop per square of netting. To estimate the amount of Net Rings for the job, multiply the number of net rings per foot by the total feet of cable being used. For example: 2" Net = 6 Net Rings per foot. 3/4" Net = 16 Net Rings per foot, or 8 if you skip every other square. Net rings come packaged 2,500 to a box. Now that the cable frame is in place, it is time to install the net that best matches your building's color and bird control objectives. The color net you chose should reflect the dom- inant color of the building. StealthNet is available in 4 dif- ferent colors: black, stone (beige) and whitel. The most commonly used color, and often the most commonly used often the least visible, is black StealthNet. Stone netting is against beige, brown, and other sandstone buildings. 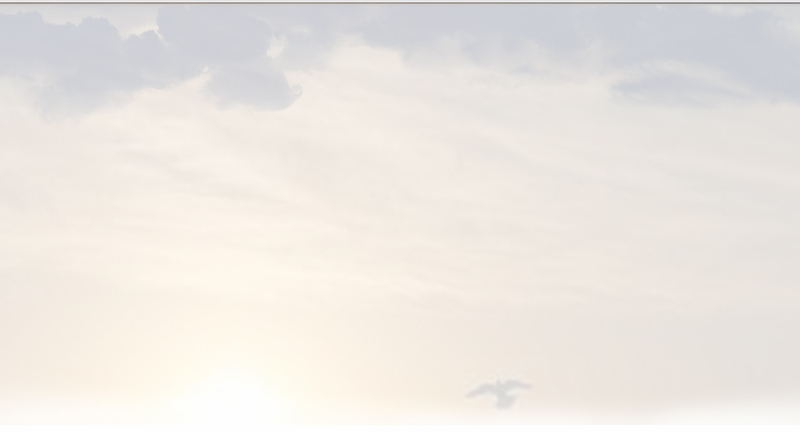 White StealthNet works best against white buildings that are not exposed to direct sun reflection or bright lights. This is due to the light reflection properties of white colors. Black should be used if bright light, like sunlight, will shine directly on it. 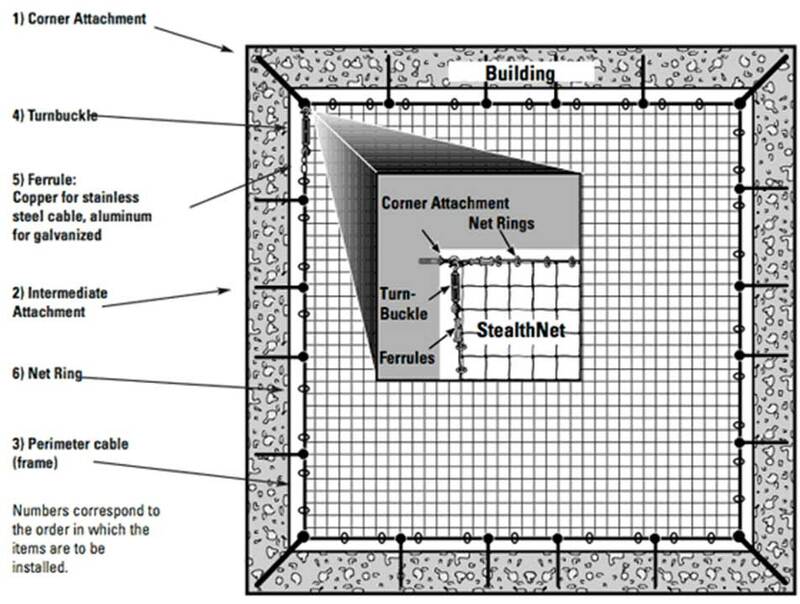 StealthNet is designed in three standard mesh sizes (size of each square) depending upon the species to be excluded. They are as follows: 3/4" - Sparrows, swallows, small birds and all large bird species 1-1/8" - Starlings, black birds and all larger bird species 2" - Pigeons and all large bird species 4" - Gulls and other large sea-birds Custom-designed mesh sizes can be created for unique species (special order product; 8-10 weeks). StealthNet is available in a variety of standard sizes and can often be cus- tom fitted to meet your projects needs. Once the net is in place, access to the area may be gained with the use of either zippers or net clips. To install zippers or net clips simply set them on top of the installed net where access is desired. Attach the zipper by net ringing through the cloth of the zip- per while grabbing the net strand as well. Net ring up both sides of the zipper to hold it firmly in place. Finish by unzipping and cutting out the middle net strands. When using net clips, slip the clips onto each side of the mesh opening and cut out the net strands between that the clips will replace. ALL NETTING ATTACHMENT MUST BE DONE IN ONE DIRECTION ONLY! NEVER attempt to work from opposite ends and meet in the middle! Netting is a complicated installation and Birdbusters recommends new installers attend our two day training course and review our installation videos to help lessen the chance of costly errors. Additional Installation Assistance While actual net installations are often very easy, some jobs can be very complicated, time-consuming affairs. The best installers have many successful jobs under their belts and learned most of their lessons on the job. Obviously a few pages of text and pictures in a manual cannot hope to make you a professional net installer, but Birdbusters's it will give you useful guidance. 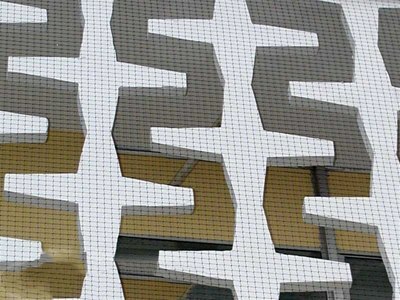 The BIRD NET bird exclusion system is extremely adaptable to nearly any architectural configuration with a wide variety of attachments for different substrates. (1) A perimeter cable supported by (2) strong corners/ends and (3) solid intermediate attachments to keep the net from gaping. There are also some special tools required for correct installation of birdnet. The most critical part of a successful?Bird Net?job is securing the tensioned cables to the structure due to the weight of the net and the strong tension-pressure applied by the turnbuckles. A variety of attachments are listed below to help you create strong cable-ends and corners to carry the weight of the load on any substrate. BirdBusters offers a variety of intermediate attachments to secure bird net to any substrate. 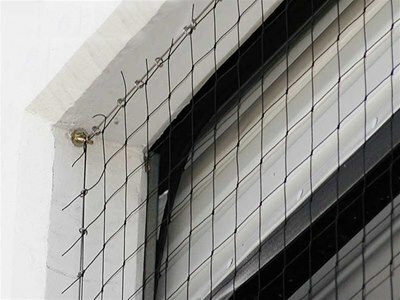 Bird Net installations require the same tensioned perimeter support system no matter what attachments are used to connect it to the structure. The cable is attached to the fasteners, then the bird net is attached to the cable with net rings (also known as hog rings) using special tools. Listed below are the key elements of the support system necessary on most Bird Net jobs.? 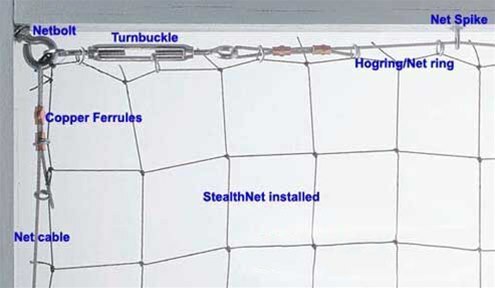 In addition to the six standard sizes of StealthNet, custom nets can be cut. Determine the cost of the net by multiplying the length by the width (to determine total square feet) and then multiply the total square feet by the price per square foot. 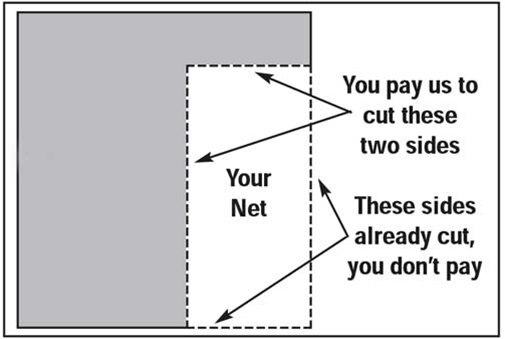 To calculate your total cutting cost, add the length plus the width of the net (to determine the linear feet) and then multiply the total by the above cutting fee for each mesh size. * A minimum cutting fee of $35.00 (per order) will apply when the calculated fee is under that amount. side may be subject to a three to four week manufacturing process. Occasionally the cutting fee can make the whole custom net more expensive than a standard size which is close to the size needed. In these cases you are better off buying the larger standard size and keeping the leftover net for future jobs. Custom net orders will generally be shipped the next day after the order is placed,except as stated above for large or long nets.